Equally wunderkinds and wonder-kids, the Chicago Cubs look to stay hot on their quest to Take October. To keep the party on Clark & Addison rolling, the Cubs will have to seize the moment and elevate their game to the next level in the Big Apple starting tonight (7:07 pm, TBS). I don’t know about New York, but in Chi-Town the buzz right now has me thinking back some to the 1992 NBA Eastern Conference Finals, an appropriate sentiment as this series features a clash of the same two titan cities for the right to go for it all. What ensued on the hardwood in 1992 — the beginning of the coronation of back-to-back Chicago Bulls champions — has the potential to be one-upped on the diamond in 2015, and if Major League Baseball has its way, this series would also assuredly go a full 7 games while along the way setting records for both television viewership and Chicago vs. New York pizza war food references. But on a very serious note, this series will be more than just Q-scores and friendly wagers between mayors — it’s a showdown between two very equally balanced ball clubs that have both exceeded expectations this year to position their teams to advance to the World Series and potentially satisfy rabid fan bases who prefer not to have their dreams deferred any longer. For my worth, an NLCS matchup against the Mets was my preferred choice over the L.A. Dodgers. At this stage of the baseball post-season, the media scrutiny surrounding October baseball is intense no matter where the games are played, but something about a potential showdown in Hollywood and the potential distractions for a young Cubs club experiencing post-season drama for the first time made me want to steer clear of that match-up altogether. And so it goes… I got my preferred choice and the Cubs got the Mets. But don’t get it twisted… I’m really not one to confuse matchup rationalizing with misguided support for a potential opponent. My life in that regard changed back in 2003 when I, like many other Cubs fan I knew, fell into a false sense of comfort and accomplishment following a surprise NLDS win over the Braves. That overzealous comfort and subsequent “who next” mindset would later lead to an ill-advised affinity toward an affable, underdog Marlins team that was locked its’ own NLDS slugfest against a Barry Bonds-fueled Giants club everyone in Chicago including Dusty Baker himself wanted no parts of seeing. We know what happened next, so no need to speak on it further…. for the pain endured still plays out like a Drake CD. Life as a Cub fan would never be the same. For what its’ worth in my book, Cubs fans don’t have the equity nor the means to overlook the New York Mets in this 2015 NLCS showdown. They, like the Cubs, have a confident, battle-tested team that was just as hot down the stretch as the Chicago Cubs. Granted the Mets are an older ball club with a different type of lineup and character, they are a very good team nonetheless – one that matches up quite evenly with the Cubs in terms of offense and pitching. Beginning with their shared pre-season fortunes and “expert” predictions of a respectable 84 wins, both teams have battled to shatter those lukewarm predictions to establish 90+ win machines and offensively charged juggernauts. In doing so, both the Cubs and Mets have developed the type of invisible chip on the shoulder that arises when a team exceeds status quo and expectations. But in baseball, that chip and the bravado that comes along with it must be earned and is never given. For both clubs to achieve what they have, both needed to make mid-season roster adjustments to address meager offenses and jumpstart second half season attacks that was largely fueled by new-found power in the lineup. For the Cubs, the steady infusion of youth and talent was capped midseason when they called-up Kyle Schwarber to stay. That move was later countered by the Mets with the pre-deadline acquisition of slugger Yeonis Cespedes. Ironically, when the Cespedes acquisition was made, the Mets were a desperately sinking team, reeling fresh off a pre 4th of July series that saw the Mets swept by the Cubs. From that point forward, both teams would display the types of second half power surges that would land them both in the top 5 for home run output in the National League, respectively. While the name of the game is outscoring your opponent by any means necessary, which at times includes laying down an effective squeeze bunt as the Cubs so clearly displayed versus the Cardinals, the potential for the long ball adds a different type juice to October baseball. That juice will be on display in a major way in this NLCS series. It’s the point in the game where the one-on-one showdown between pitcher and batter is heightened the most. It’s the time of the year when games are often times tightly played, high leverage – low scoring affairs, with the type of “Wow!” that comes from seeing an at-bat and ensuing swing shift the entire outcome of a game, or even a series. Please believe both teams will enter the series with a nothing-to-lose, everything-to-gain mentality that will assuredly provide some entertaining sports drama over the next 10 days. And when home runs are not in play, as many sports analyst turned meteorologist are predicting given the ensuing, cool fall weather; expect to see small ball execution become a critical factor in the outcome of the next 7 games. 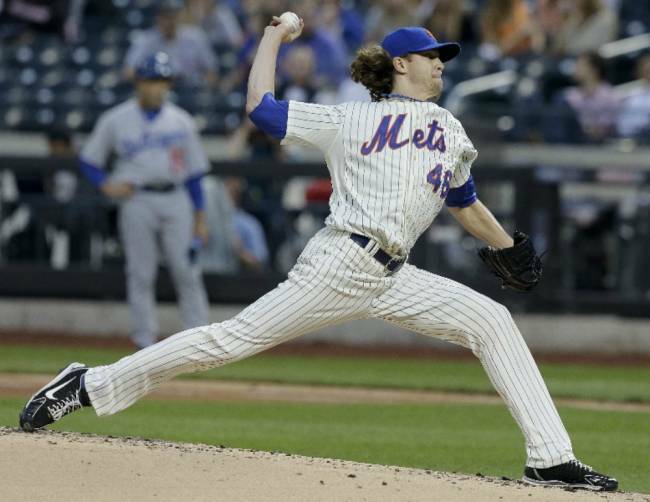 Young Mets hurler Jacob DeGrom was a difference-maker against Los Angeles, starting and winning two games, including the decisive Game 5. The Mets pitching staff is a formidable frontline four of Matt Harvey, Jacob deGrom, Noah Syndergaard, and the eternal Bartolo Colon: a stout stable of horses featuring A+ power pitching and a little shake and bake. The ability and likelihood of all four Mets pitchers being able to pitch deep and give 5-6 quality innings of production is what scares me, especially when in contrast to the series starters the Cubs will roll out. We know what we have at this time of the season, and the Cubs have known commodities and assured quality production in Lester and Arietta, but the fall off from there is real. The NLCS is not a 5-game battle, it’s a 7-game war… one where the added two games play critically on the starting rotation over the series course. And moreover, high leverage inning fatigue comes into play and weighs heavily on a bullpen almost instantly. To effectively counter the Mets’ frontline production, the Cubs desperately need one solid starting outing from someone not named Arietta, or Lester. Slotted starters Kyle Hendricks and Jason Hammel have consistently struggled to gain Joe Maddon’s confidence enough to be entrusted with longer leashes in their respective outings. Maddon goes in with a plan to pull both starter after three or four innings, and promptly begin throwing hay-makers, smoke bombs, and Molotov cocktails from the bullpen. By game four, I wouldn’t be shocked if we heard Maddon bestowed the nickname Captain Quick Hook for use of his skillful art-form of bullpen skullduggery. The quick-hook strategy since late July that Maddon has employed with his numbers 3 thru 5 starters has been effective, albeit unproven in October. And while Travis Wood and Clayton Richard have held down the fort and pitched as well as anyone could have expected, the mental pressure and swing of emotions that comes with making pitching switches, in general, in October can be daunting – if not ominous. Coming off plentiful rest and a confident set of back end bullpen arms, and with reinforcements on the way in the form of Jason Motte, expect Maddon to stay the course and continue to employ his attack. But how long that attack can hold up over a 7 game series remains to be seen. For now, I’m saying the bench mark in terms of production for at least one non-Arietta/Lester start for the Cubs has to be 6 innings…preferably 6 innings of scoreless baseball. The Cubs only need one surprise outing to bump the odds in Chicago’s favor. In a series where all things balance out and an evenness to each side’s attack being the great equalizer, I expect to see this NLCS series play out like an all-nighter game of Strat-O-Matic. Given that neither Maddon, nor Collins — a former Anaheim Angels coaching staff mate and counterpart of the Mike Scioscia tree — are strangers to manufacturing runs this series very well could boil down to a match of wits, bullpen maneuvers, and small ball execution between entrusted baseball brains who come from the same school of thought. To encapsulate the sentiment I have for this series, I find myself digging through the albums and dusting off my De La Soul “Stakes is High” CD. Sitting between a New York City night and a Joe Maddon crapshoot, what else can anyone expect?